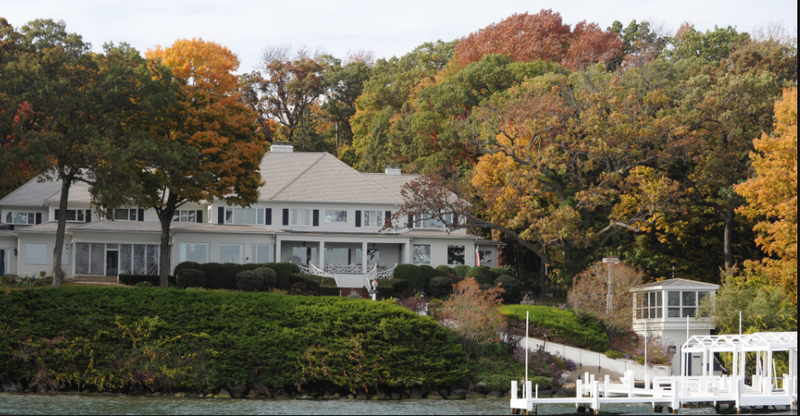 I’m back for another stop on our tour of the old mansions that once graced the shoreline of Geneva Lake, the second largest fresh-water lake in the state of Wisconsin (Green Lake being the first). 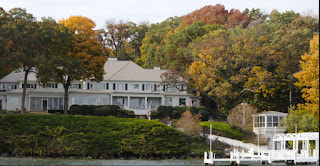 This month we’re going to stroll down the shore path past several other properties to Tyrawley. This home has gone through several metamorphoses—both in appearance and in name—over the years. 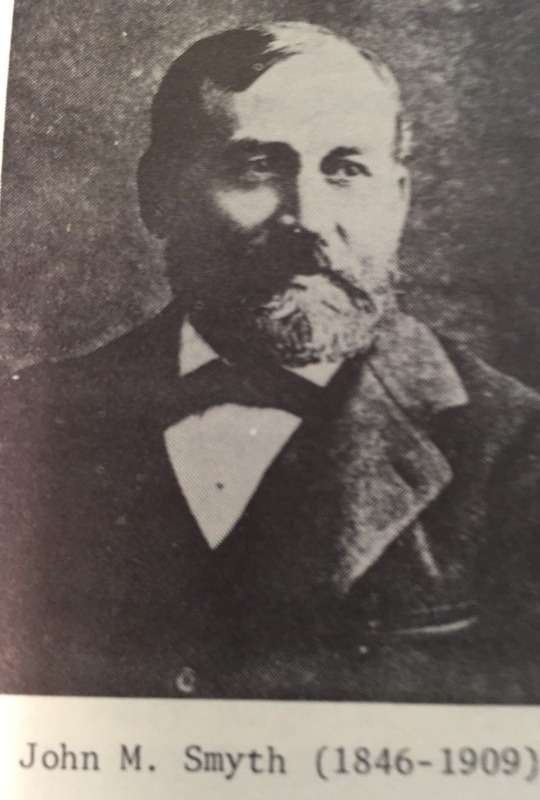 The original owner of the estate, John M. Smyth, was born on the high seas during his parents’ crossing from Ireland in 1843. By the time he was 13, his father had already passed away and he left school to start work in the composing room of the Chicago Tribune. At the age of 23 he had managed to save enough money to start a small furniture store, which was later destroyed by fire. Determined to not let the loss get him down, he built a new building on the same spot as the first. The store stood for many years and was well known to most Chicagoans. In fact, many will remember the radio commercial that instructed people how to pronounce his name. “Some call it Smith, but we call it Smyth" was the slogan. The ‘y’ in the name was pronounced like a hard ‘i’. Smyth was a well-liked man and was even encouraged to run for mayor of Chicago on the Republican ticket, but he refused. 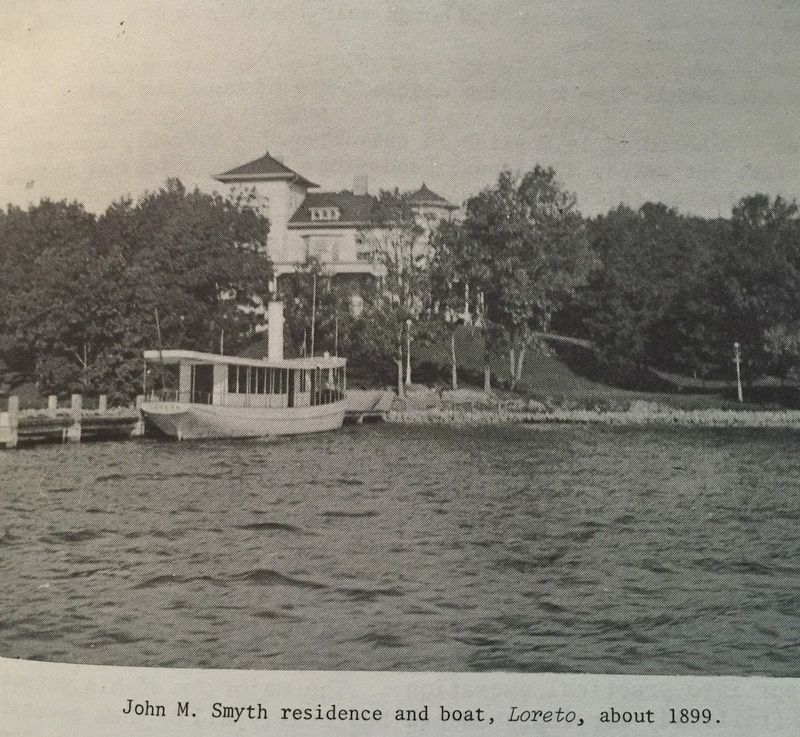 In 1892, the family visited the Lake Geneva area, and when Smyth was offered 28 acres on the lake’s north shore, he snapped it up and engaged a Chicago architect to design a California Mission style home. The foundation was composed of native fieldstone, while the rest of the home was constructed of wood, which was painted light grey with green trim. The interior sported a large fireplace mantle of African marble and white oak. It’s carved staircases were designed with broad landings, and gold-plated hardware was installed throughout the first floor. A large carriage house that included a living quarters for the coachman, matched the main house, as did all the utility buildings. 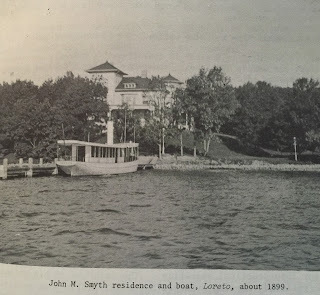 Like a lot of the estates on Geneva Lake, Tyrawley had it’s own yacht, The Loreto, which was used to meet the family in Williams Bay when they came by train from the city and, later, to ferry Mr. Smyth across the lake to the country club for a game of golf. 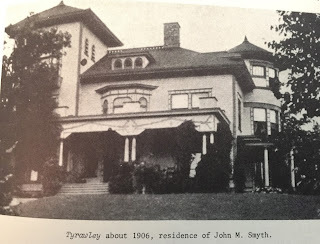 Mr. Smyth died in 1909, and the family held the estate for two years before it was sold. Thus began a series of owners, the first two in rather quick succession before W.H. Alfords purchased the estate and changed its name to Stone Gates. In the 1930s, during their radio hey-day, Amos and Andy broadcasted their show from the home’s front porch through a hookup with a Chicago radio station. It’s been said that neighbors would come by boat to sit in the water in front of the home and watch as they did their show. Those broadcasts must have ended in 1937 because William H. Emery purchased the property at that time and changed the name to Tarry On. The Emerys extensively changed the exterior of the home and it is difficult to see the original design at all by looking at the home today. Tarry On as it appears today. As I was first preparing this post, until I read about the Emery family purchasing it, I didn’t realize this home was what I’ve always known as Tarry On. I am an acquaintance of one of William Emery’s daughters, and another friend’s father was a caretaker for the estate next door to Tarry On. All of the land had been part of Smyth's holdings when Tyrawley was built. It dawned on me that the building my friend’s family lived in for many years is the old carriage house for Tyrawley. It was still painted light gray and green the last time I saw it. When I recently told my friend what I had learned about the property and the home she grew up in, she said that horse stalls were attached to the large garage that opened at either end (from its carriage house days). Of course, the stalls have not been used for that purpose for many years, and I wasn't aware that they were there. She said that a long while ago she told me some of what I'm reporting here now, but at my young age I wasn't that interested so it never stuck. Have you learned historical facts about places you've known all your life but never cared about it's historical significance until many years later? I learned a lot of things in History classes, but the teachers made it so boring, I forgot it all. 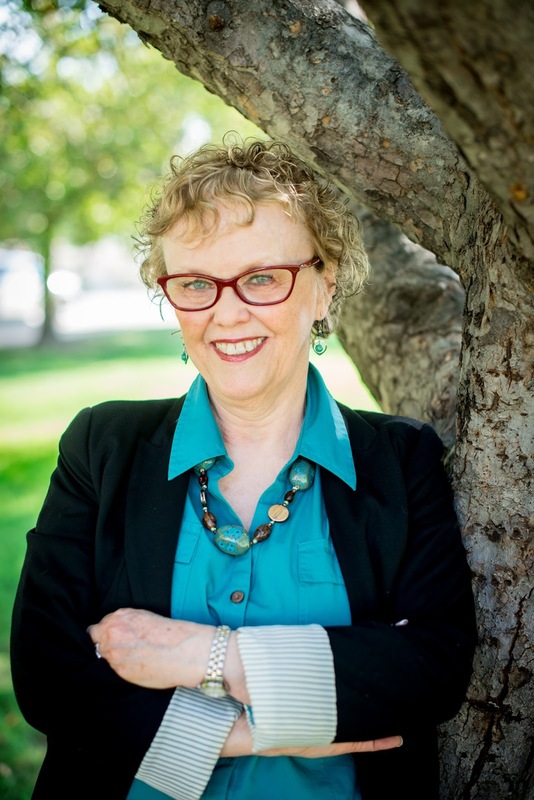 I am just recently loving to read about History, especially California history.